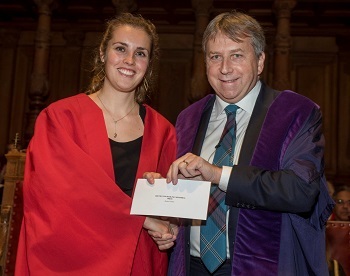 Congratulations to Rachel Fisher for the award of the William Darling Memorial Prize for her work in enhancing the reputation of the University. Rachel, who has recently completed her PhD, was awarded this prize in recognition of her outstanding contributions to Public Engagement. Rachel has made a huge contribution to the public engagement within the School of Chemistry, getting involved in the development, coordination and delivery of not only science festivals, but workshops, meet the expert events at museums, work experience visits, doors open day and dancing! After submitting her PhD thesis earlier this year Rachel volunteered for Salaam Balaak Trust, a charity based in New Delhi, India. During her time in Delhi, Rachel worked with woman and girls to create a film and talk to focus on the specific ‘women’s issues’ of women and girls living on the streets, highlighting the specific vulnerabilities of these women. Rachel plans to continue to stay in touch with the charity and volunteer with them again in the future. I am delighted to receive this award. I really enjoyed all the science outreach I was involved in and so winning the prize was very gratifying and has inspired me to continue to get involved with more outreach activities in the future.